There's good reason to take Tesla's big vision seriously. But don't get too excited. In an active session on Twitter this weekend, Tesla Motors (NASDAQ:TSLA) CEO Elon Musk shared information about the company, including that Tesla hopes to publish a second part to its Top Secret Tesla Master Plan this week. Tesla stock is up about 4.5% at the time of this writing, on Monday, as investors speculate about what this plan may entail. "Working on Top Secret Tesla Masterplan, Part 2," Musk said on Twitter this weekend. "Hoping to publish later this week." To understand more about the relevance of a part two to Tesla's master plan, investors should first understand what part one entailed, which was published 10 years ago -- before Tesla delivered a single car. "As you know, the initial product of Tesla Motors is a high performance electric sports car called the Tesla Roadster," Musk said in the blog post about one-and-a-half years before it delivered one. However, some readers may not be aware of the fact that our long term plan is to build a wide range of models, including affordably priced family cars. This is because the overarching purpose of Tesla Motors (and the reason I am funding the company) is to help expedite the move from a mine-and-burn hydrocarbon economy toward a solar electric economy, which I believe to be the primary, but not exclusive, sustainable solution. Elon Musk unveils step three of its first masterplan earlier this year. Image source: Tesla Motors. When Tesla's master plan was initially shared, there wasn't much reason for investors to take it very seriously. But in less than 10 years, Tesla has executed at a ferocious pace, giving more credence to Musk's big vision for the future. Tesla has already completed the first and second steps by bringing to market its Roadster (the "sports car") and its Models S and X (the "affordable car(s)"), and is now starting on the third step by readying its $35,000 Model 3 for a 2017 launch. Further, Tesla has begun addressing the final point in its master plan by recently bringing to market its energy storage products and offering to acquire SolarCity -- a solar panel company. 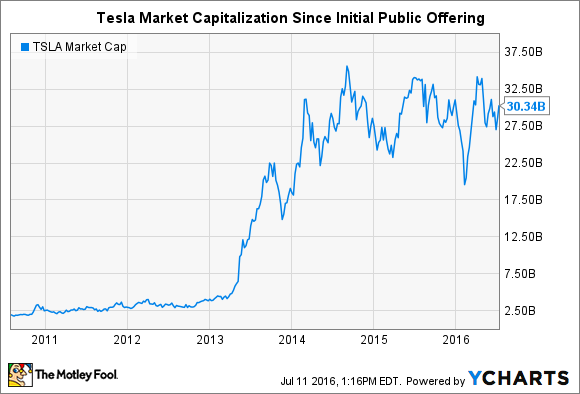 Since Tesla posted the first part to its master plan, the company went public in 2010, and its market capitalization has subsequently soared from less than $2.5 billion to around $30 billion today. TSLA Market Cap data by YCharts. Accomplishing so much in such a small span of time, and exceeding all expectations investors had for the company when it went public just six years ago, there's good reason to give some weight to part two of Tesla's secret master plan. When Tesla does unveil the second installment of its secret masterplan, investors should keep in mind that the stock is already priced for significant growth over the next decade. Therefore, while investors may want to listen carefully to whatever the company unveils about its future plans later this week, Tesla still hasn't yet achieved arguably the most important step in its first master plan: bringing to market an even more affordable car. It would be difficult to overstate the importance of this third step; after all, the Model 3 is supposed to be the vehicle that will take Tesla from selling around an estimated 80,000 vehicles this year to around 500,000 vehicles annually by 2018. Given how important the Model 3 is to Tesla's stock price, the stock is already arguably priced with speculative assumptions baked in. Therefore, no matter how impressive part two of Tesla's secret master plan may appear to be, investors should consider carefully whether it actually impacts the stock's value today. Forward-looking assumptions should be considered with a skeptical eye, keeping in mind the many risks that could arise as Tesla continues to grow.